Easton is a town in Grafton County, New Hampshire, United States. The population was 254 at the 2010 census. Formed from a part of Landaff known as Eastern Landaff, Easton was incorporated in 1876. Kinsman Mountain, the Kinsman Range, and Kinsman Notch are named for Nathaniel Kinsman, one of the original settlers. According to the United States Census Bureau, the town has a total area of 31.2 square miles (81 km2), of which 0.03% is water. The highest point in Easton is 4,040 feet (1,230 m) above sea level, just west of the 4,293-foot (1,309 m) summit of the North Peak of Kinsman Mountain. The Wild Ammonoosuc River drains the southern part of town, while the Ham Branch of the Gale River drains the northern portion and passes the town's village. Easton lies fully within the Connecticut River watershed. As of the census of 2000, there were 256 people, 117 households, and 84 families residing in the town. The population density was 8.2 people per square mile (3.2/km²). There were 187 housing units at an average density of 6.0 per square mile (2.3/km²). The racial makeup of the town was 96.48% White, 0.78% Native American, and 2.73% from two or more races. Hispanic or Latino of any race were 0.78% of the population. There were 117 households out of which 23.9% had children under the age of 18 living with them, 58.1% were married couples living together, 10.3% had a female householder with no husband present, and 28.2% were non-families. 23.1% of all households were made up of individuals and 6.8% had someone living alone who was 65 years of age or older. The average household size was 2.19 and the average family size was 2.54. In the town, the population was spread out with 19.1% under the age of 18, 3.9% from 18 to 24, 22.3% from 25 to 44, 35.2% from 45 to 64, and 19.5% who were 65 years of age or older. The median age was 47 years. For every 100 females, there were 98.4 males. For every 100 females age 18 and over, there were 97.1 males. The median income for a household in the town was $49,167, and the median income for a family was $69,375. Males had a median income of $41,875 versus $23,750 for females. The per capita income for the town was $31,841. About 6.0% of families and 10.0% of the population were below the poverty line, including 30.6% of those under the age of eighteen and none of those sixty five or over. ^ United States Census Bureau, American FactFinder, 2010 Census figures. Retrieved March 23, 2011. ^ Foster, Debra H.; Batorfalvy, Tatianna N.; Medalie, Laura (1995). Water Use in New Hampshire: An Activities Guide for Teachers. U.S. Department of the Interior and U.S. Geological Survey. 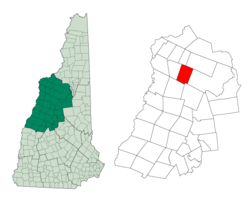 ^ "Annual Estimates of the Resident Population: April 1, 2010 to July 1, 2017 (PEPANNRES): Minor Civil Divisions – New Hampshire". Retrieved November 14, 2018. ^ "Census of Population and Housing". Census.gov. Archived from the original on May 12, 2015. Retrieved June 4, 2016. This page was last edited on 14 November 2018, at 19:33 (UTC).